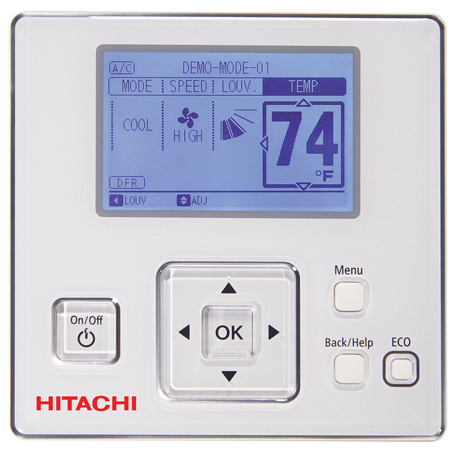 The wired zone controller offers occupancy-based operation (on select indoor units), a self-diagnosis function that checks for problems on printed circuit boards in indoor and outdoor units, temperature range limit, set temperature auto reset, an off timer and individual function lockout for mode, temperature and fan speed. Controls temperature, mode, fan speed. Seven-day timer with multiple set points. Controls up to 16 indoor units. Room name and service company name programmable. Help menus and error code diagnosis. Large LCD display permits users to see the operating conditions and settings. Timer can be set at half-hour intervals up to 23 hours. Monitors the operating conditions in the system, and an alarm is issued if a problem occurs.